Spanish water dogs are active, intelligent dogs with coats that can form cords. Find out what else makes them unique in our breed profile. Spanish water dogs are medium-sized dogs with non-shedding curly coats that come in colors of black, brown, beige, white or colored with white as a secondary color. The woolly textured coat naturally mats and can form cords, as seen on the Komondor or Puli breeds. SWDs have expressive eyes and webbed feet to help them navigate water. They are intelligent and versatile companions that live an average of 10 to 15 years long. Males range in height from 17 to 19 inches with females slightly shorter at 15 to 18 inches. Weight ranges for males are 40 to 50 pounds, while females generally weigh 10 pounds less (30 to 40 pounds). The exact origin of the SWD is debated, but most people agree this is an old breed. Evidence of dogs matching the SWD’s description surfaced on the Iberian Peninsula in 1110. The breed was used in Spain in the 1700s for herding livestock. The dogs were able to work in hills and mountainous areas, although they were also used to tow boats to shore. A common helper to fisherman, SWDs would also assist with fishing nets and hunting game in water and on land. The SWD became better known after being shown at a conformation event in Spain in the 1980s. Several people worked together to gain recognition for the breed, and the SWD was internationally accepted in 1999. The American Kennel Club changed the breed’s classification from miscellaneous to the herding group on January 1, 2015. SWDs were originally herders, hunters and helpers to fisherman. Today they can still be found herding cattle, pigs, goats and sheep, although they are also companion pets. They participate in search and rescue, bomb detection, conformation, agility, water work, tracking, obedience and flyball. High energy is a great description of this breed. There are many desirable qualities of SWDs, such as loyalty, protectiveness, loyal and affectionate. They can be wary of strangers, shy, moody, manipulative and territorial. They are good for families but may be too high-energy for young children. They may also try to herd the children and nip for non-compliance. Sensitivity to sudden sounds and movements has been observed in some dogs. Thorough socialization is highly recommended. This active breed needs daily walks and play to expel energy. The dogs can be fast with seemingly endless stamina. Excessive activity for puppies should be discouraged because of the risk of injury as they are growing. The amount of grooming needed depends on the work of the dog. Working Spanish water dogs may need to have shorter coat lengths maintained, while others can be left to grow longer. The single curly coat mats naturally and can form cords. These can be separated as needed. Bathe as needed but avoid using a hair dryer or rubbing excessively with a towel when drying the coat. Although the SWD is considered hypoallergenic, people with allergies may still be sensitive to this nonshedding dog. Hair growth in the ears can be problematic and cause persistent infections, so they should be cleaned regularly along with the teeth and nail maintenance. 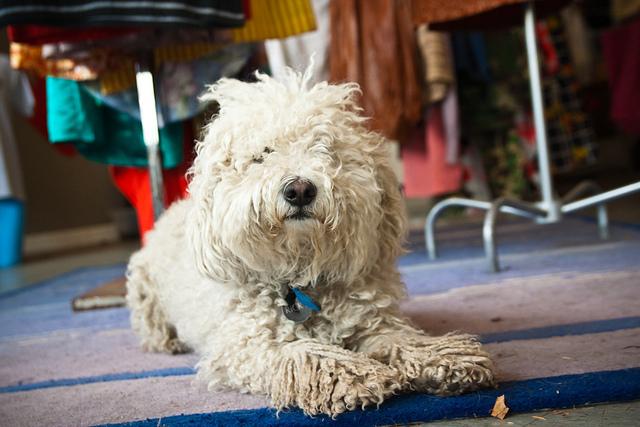 Is the Spanish Water Dog the Right Pet for You? The Spanish water dog is an active, high-energy breed with herding instincts. These dogs are not recommended for homes with kids but can make excellent family pets. There are a few health issues to monitor, and grooming will depend on the role of your dog. Working and show dogs will require more attention to their coats. The breed can be wary of strangers and territorial, so socialization is a must. Daily exercise will require a time commitment on your part, so consider these attributes when choosing a Spanish water dog as your next pet. Spanish water dogs, as with any purebred dog, can end up in shelters or rescues. Check adoption resources first, or review our list of puppy mill red flags to ensure you find a reputable and responsible breeder.